Runners from all over the state flock to scenic downtown Houma for TFAE's Run for Excellence. Don't want to register online? No problem! Just click and print this registration and mail it to us at the address below. 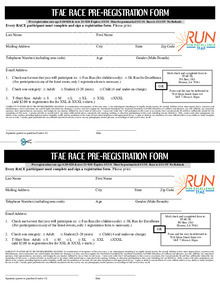 The TFAE 5K Run for Excellence is Saturday, May 11, 2019 in downtown Houma. On-site race registration starts at 4 p.m. Kids' Fun Run starts at 5:30 p.m.
5K Run for Excellence starts at 6 p.m.
Don't miss the After Party! Our Food Fest is open from 6:30-10 p.m. and features a fun Kids Korner, delicious food from local vendors, all-you-can-drink beverages, and live music from The Flamethrowers!